Explore the highly-intricate and pink Banteay Srei Temple, which translates to "The Citadel of Women"
Covered all attractions timely. Just that day was too hot. Vehicle was old and AC was not effective. Lot of great pictures and able to relate Hindu mythology with temple carvings. Suggest this iternary on not so hot day. Witness the penultimate spirit of the mighty Khmer empire in the Angkor temples situated in the heart of the awe-inspiring Siem Reap. On this tour, you are given two classic itineraries, allowing you to experience the fascinating beauty of some of the largest religious monuments in the world. After departing from your hotel, see the charming former kingdom and its interesting blend of ancient and modern remains on your way to the Angkor Wat. 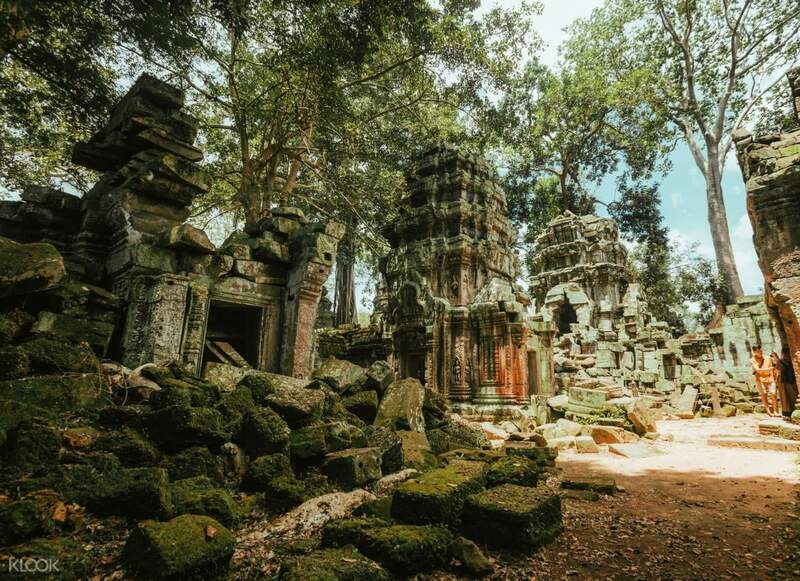 The temple complex is the perfect photographic opportunity waiting to happen, with its sophisticated stone temple mountain and its lush forested areas that tell the tales of the once great Cambodian history and myths. 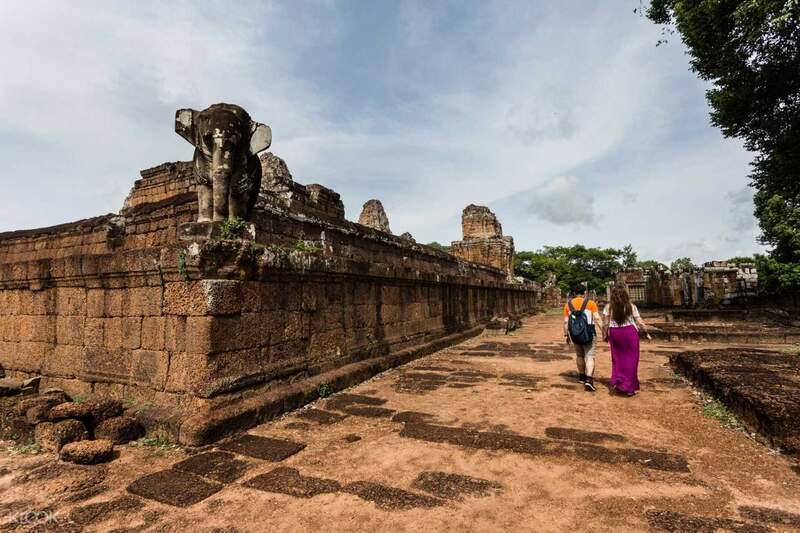 Move on to the Angkor Thom, another expression of Khmer's highest accomplishments, covered an entire nation dedicated to Buddhist cosmology, also serving homes to priests, officials of the palace and military. Next you will visit the Bayon, also known as the "face temple" of the country's most celebrated king, Jayavarman VII. Other than the king, legendary Cambodian personalities surround the prominent royal, glaring down from every angle, giving off a sense of power, control, and humanity. Afterwards, you will enjoy a hearty lunch of sumptuous Cambodian recipes before going to the Taphrom temple, the famous filming location of the Hollywood film, Tomb Raider. Embark on an exciting adventure to the urban landscape nestled within the temple-filled resort town, where you'll see eclectic cafés and classy nightlife. 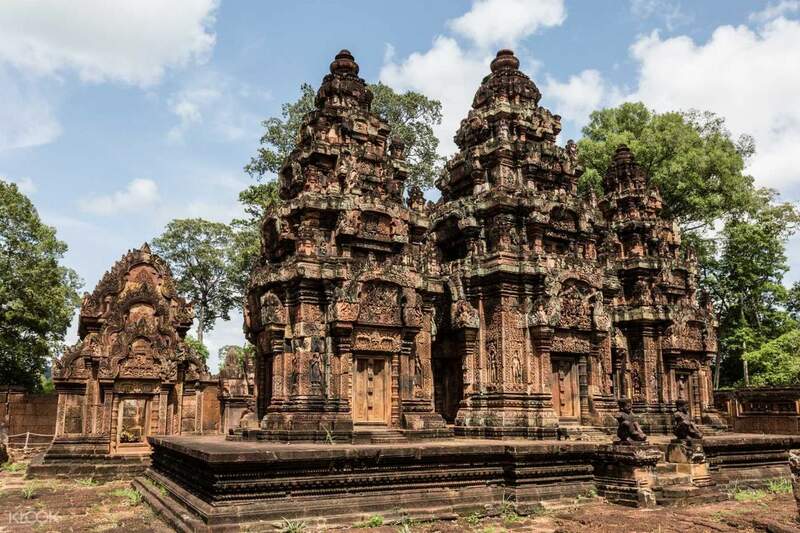 If you're up for some more temple sightseeing, you can opt for a visit to the beautiful Banteay Srie Temple, a wonderfully preserved place of worship dedicated to the Hindu god Shiva. 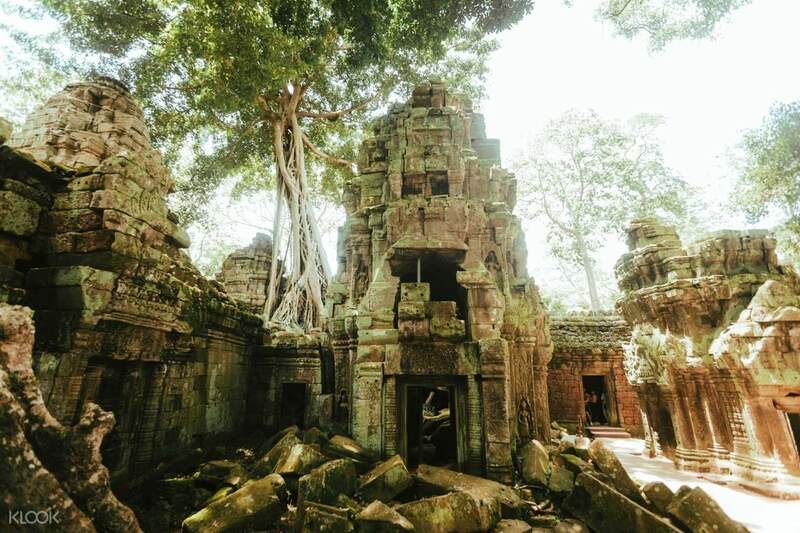 Witness the amazing stone architecture of the sprawling ruins of the Khmer empire when you book through Klook! This is highly recommended, totally value for money. Our driver, Weng, picked us up on time. He's consistently opened the door whenever I get on and off the car. He drives well. He is very informative and knowledgeable about Angkor Wat, it's like we have a tour guide as well. Our 10 hours were spent according to our itinerary and pace. Every time we return from a temple, he hands us cold bottled water, which is much needed after walking under the scorching heat of the sun. This is highly recommended, totally value for money. Our driver, Weng, picked us up on time. He's consistently opened the door whenever I get on and off the car. He drives well. He is very informative and knowledgeable about Angkor Wat, it's like we have a tour guide as well. Our 10 hours were spent according to our itinerary and pace. Every time we return from a temple, he hands us cold bottled water, which is much needed after walking under the scorching heat of the sun. The best option for those who want to enjoy Angkor Wat temples on your own pace. Spend as much or as little time as you want while your driver waits for you. I realised that it is cheaper to book from Klook than booking on site. Definitely worth it! The best option for those who want to enjoy Angkor Wat temples on your own pace. Spend as much or as little time as you want while your driver waits for you. I realised that it is cheaper to book from Klook than booking on site. Definitely worth it! A very tiring, but fantastic day visiting Angkor Way and other temples. An absolute must when visiting Cambodia. A lovely country with very genuine people. We will definitely come back. A very tiring, but fantastic day visiting Angkor Way and other temples. An absolute must when visiting Cambodia. A lovely country with very genuine people. We will definitely come back. Weng (our driver) was very good, did not expect free water on our trip. Plus he also explained to us some history and culture of Cambodia. So happy we took him to dinner with us and watch the Apsara Dance at Koulen II Restaurant. Weng (our driver) was very good, did not expect free water on our trip. Plus he also explained to us some history and culture of Cambodia. So happy we took him to dinner with us and watch the Apsara Dance at Koulen II Restaurant. Absolutely necessary to be able to get some respite from the heat and humidity between the temples. The guide and driver were both very nice. Bhun-I, the guide, was very accommodating of our requests, was very knowledgable, and helped us take some really nice photos. Absolutely necessary to be able to get some respite from the heat and humidity between the temples. The guide and driver were both very nice. Bhun-I, the guide, was very accommodating of our requests, was very knowledgable, and helped us take some really nice photos. We had a great experience being guided by Sothea Yon. We have 3 children, ages 7 and 9 and he was excellent knowing how to pitch the history so that they could understand and remained interested. The lunch was great as well. I highly recommend this tour and guide. We had a great experience being guided by Sothea Yon. We have 3 children, ages 7 and 9 and he was excellent knowing how to pitch the history so that they could understand and remained interested. The lunch was great as well. I highly recommend this tour and guide. Our driver was on time. He gave us extra information about sites. We had a custom itinerary, but he was happy to take us to extra places too . The lunch restaurant was a little expensive, but the quality of food was great. Highly recommended to take a car to Banteay Srei, as the road is dusty and bumpy for a tuk tuk. Thanks Klook! Our driver was on time. He gave us extra information about sites. We had a custom itinerary, but he was happy to take us to extra places too . The lunch restaurant was a little expensive, but the quality of food was great. Highly recommended to take a car to Banteay Srei, as the road is dusty and bumpy for a tuk tuk. Thanks Klook! Good experience, learning their culture and architectural temple, Angkor Wat. friendly people and nice driver and tour guide, Touch. Good experience, learning their culture and architectural temple, Angkor Wat. friendly people and nice driver and tour guide, Touch. Amazing tour with Mr. Try Dara. Knowledgeable and professional, he is a gem! He took really great photos of places and of us. Siem Reap is an amazing place! Amazing tour with Mr. Try Dara. Knowledgeable and professional, he is a gem! He took really great photos of places and of us. Siem Reap is an amazing place!